The E91 BMW was part of the E90/E91/E92/E93 generation of BMWs 3-series was introduced in the 2006 model year for the USA with a number of sweet sounding inline-6s. It was the last generation of BMW's iconic compact executive sedan to use a conventional hydraulic steering assist (electric power steering = yuck!) and naturally aspirated inline-6 engines. 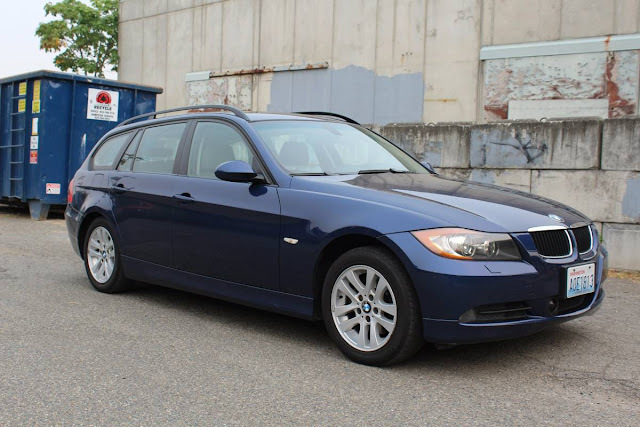 Find this 2006 BMW 325xi Touring offered for $10,995 in Seattle, WA via craigslist. Tip from Patrick. 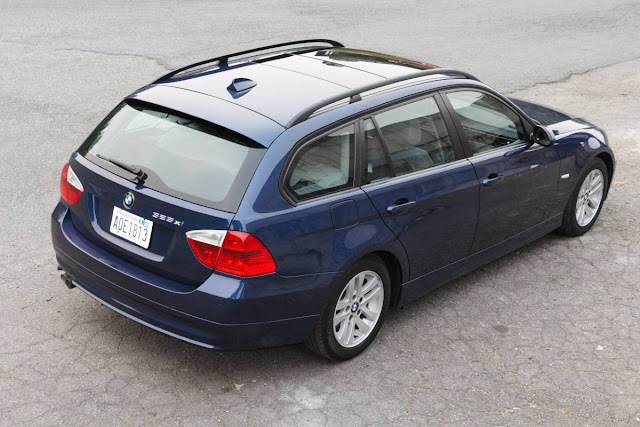 Sport wagon enthusiasts: Hard to find 2006 BMW 325xi touring 6-speed manual transmission. Great 6 cylinder manual transmission E91. The car is painted Mysticblau over grey leather interior, and is nicely optioned with iDrive, adaptive cruise, backup display, heated seats, etc. Strong reliable 3.0l inline 6 cyl. N52 motor. I bought this wagon in October of 2013, from Elliott bay auto brokers with 98,000 mi. on it. I have put about 5K a year on it since. I seem to be the third owner. The Odometer now shows 118,000 mi. Some wear on interior colored surfaces like door handles. Driver's cup holder stuck closed. + Repaired faulty CC (iDrive) unit, by HI-Tech electronics, Van Nuys. The only negative worth mentioning is a slight oil seepage from the pan gasket, which only lets loose with a drop of oil every once in awhile. It is a nuisance that I have not addressed. Center control panel is flopping around because I did not install it correctly while replacing the CC unit. The runflat tires are due for replacement. I'll let the new owner choose the next set of tires to suit their needs. As the seller of this car, I can answer your question. I am selling the car because my needs have changed. I'll be purchasing a Mercedes Benz Metris cargo van to support my vintage motorcycle racing activities. I still love the wagon, but only want 1 car. This might answer your question: Driver's cup holder stuck closed. We Americans g=have certain standards that must be upheld! that's still a really nice car. I would love to buy it for such a reasonable price and in such a good condition but unfortunately I live too far away from you.